It's been a long time since I posted a pattern, but after making three pairs of these slippers I think I finally have something worthy of sharing. 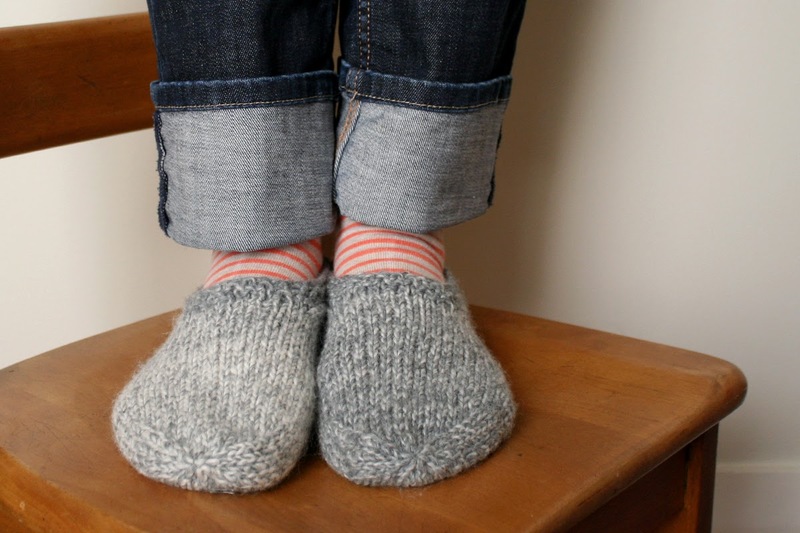 And with both winter and the holidays looming there's enough reason to either keep your own feet warm or make a quick pair for someone you love. I first knit these in the summer on our cold cottage vacation in Prince Edward County. Even though our stays are short, I always feel very inspired, creative and relaxed when we're there. Named after our South Marysburgh location, these slippers are simple and tailored, and hopefully bring you comfort akin to the best of quiet vacations. Size is for an average women’s foot, but with a flexible length. Although I haven’t tested it, I think a thicker wool and/or larger needles would result in a size suitable for men. If anyone wants to try it I’d love to hear the outcome! Starting with a knit row, work 12 rows in st st, ending on a WS row. On next RS row, K14, skp, and turn your work. R1: (WS) sl1, P9, P2tog, turn your work. R2: (RS) sl1, K9, skp, turn your work. Repeat these two rows until you have 11 sts left on your needle, having just finished a RS row. With the RS still facing you, pick up 8 sts along the st st edge to your left and place them on your needle. Turn your work and purl across all 19 sts on the needle, then pick up 8 more sts on remaining st st side and place them on your needle too (27 stitches total). Starting with a K row, work 15 rows in st st.
Slip marker and K4. To make the decreases more manageable, shift your stitches around a little: place the next 9 stitches on a DPN and think of this as your first needle. Place the next 9 stitches on another needle, followed by 9 sts on another, and then another. Your stitches are now divided equally over 4 needles. You can remove the marker at this point (which would be happily nestled between stitches on your fourth needle). The following rows start at the first stitch on your first needle. Cut yarn and thread through remaining stitches. Tighten and weave in yarn end on the inside of the slipper. At this point the slipper is pretty cute and wearable, but if you’re anything like me, you might prefer a nice finished band. Using DPNs, pick up 45 stitches evenly around the slipper opening (14 across the heel section, 11 along each side and 9 across the front) and place marker. R1: [K1, P1] to end. R2: [P1, K1] to end. R3: [K1, P1] to end. Bind off using 5.5mm needle so that the opening is flexible. Make a companion slipper following the same instructions. Weave in ends and immediately slip onto a pair of cold feet. In the new year I plan to convert all my patterns to pdfs so they are easier to reference (not to mention, a little less old-school), but for the time being I hope this pattern-in-a-post suffices. And since today is Ginny's Yarnalong, my small reading update is that I'm slowly working through Mira Bartok's The Memory Palace: A Memoir. It's a heavy, but impactful read. There's simply no way to rush through it. These look fab! Thanks for sharing! Oh my, this pattern came right in time for Christmas knitting! Thank you for sharing! These are fantastic - love both the shape and the simplicity. Thanks so much! could the whole thing be done on 1 long circular needle? I don't do anything on DPNs, nor do I know how to do so-I knit all my socks on Magic loop. I was seduced by the picture and started knitting, not knowing anything about DPNs. I realised I needed to buy DPNs and spend a bit of time on YouTube to figure out part of the pattern. Conclusion: knitting with DPNs is easy - it just looks impressive from the outside. And this is an excellent pattern as a 'first' DPN project. It is also good to finish end bits and bobs of different yarns (as I've done). And the result is super comfy and quite elegant. 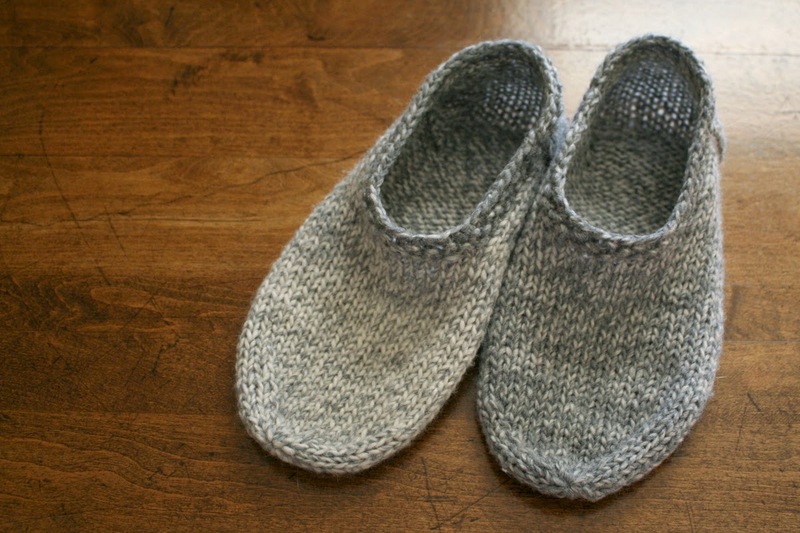 The slippers looked small when finished (I size 38) but the wool stretches so they fit fine. Thank you and congratulations for this great pattern! Just a little "knit-picky" thing - after turning the heel you need to pick up *and knit* the 8 additional stitches on the first side, then purl across and pick up *and purl* the next 8 stitches. This would probably be obvious to an experienced knitter but merely picking up the stitches will leave your working yarn in the wrong place and might confuse a novice. But it's a lovely pattern! I've learned to knit on dpns using your lovely pattern. It's well written and I'm enjoying knitting them. They are perfect for people who visit my daughter in law in Turkey where people take their shoes off at the door. Thank you so much for sharing your talent. Your pattern is lovely - one can use printfriendly.com to make a print-friendly version, or a pdf version to save. If you use the magic loop method. Go to YouTube.com tutorials for instructions for using this method. I Easy, but I'd rather use my dp needles. I am Nancy. Wouldn't allow me to change name. Having trouble turning the heel. thank you so much for the pdf version especially...i look forward to making these for my daughter and her partner! hopefully many more! Awesome post! Now spring has sprung, what better way to dress for it than a baby flower bonnet hat! It's super easy to make.... The hard part is convincing the baby to wear it! 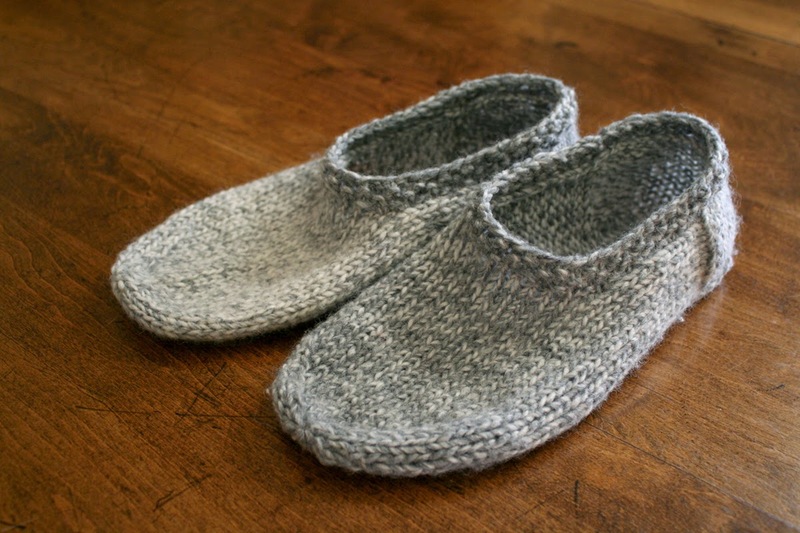 Love the slippers (and all your knitting projects)! Thanks for sharing your pattern and providing a pdf version. You're kind and generous. Hello, I just saved your pin as I like your slippers on Pinterest, looks like they could look good on a guy as well. I also like your surname! My maiden name was Lamb. I don't have any little people with the middle name Lamb though, I think that's very cute. My mother happens to live in Toronto but she has remarried so is no longer a Lamb. I live in Pembrokeshire, Wales but my farher's family live in a village in Oxfordshire where there have been Lamb's since at least the 1600's. Who knows, we might be related! Busy knitting for little grandchildren at the moment but looking forward to trying your slippers one day. Thank you so much for sharing this pattern. These are so much cuter than many of the patterns l've found and l can't believe how quick and easy they were to make - finished both in one evening. This is the first time I've tried knitting slippers so expected to have difficulty turning the heels at least but, got it right first try, thanks to your fantastically clear instructions. Great stash buster too - am already hunting out some more leftover wool for the next pair. Wow ! Awesome post ! I've been working on saving up some outfits so I can do this .Maybe I'll have to go thru them to see if I have enough already! Great thanks ! Check out Best Baby Product Reviews. Thanks! Addicted to all things small and made from wool. Oh, and two little people with the middle name Lamb.